As you can see from the graph above, Facebook represents the largest advertising opportunity when compared to traditional advertising mediums as well as the Internet as a whole. 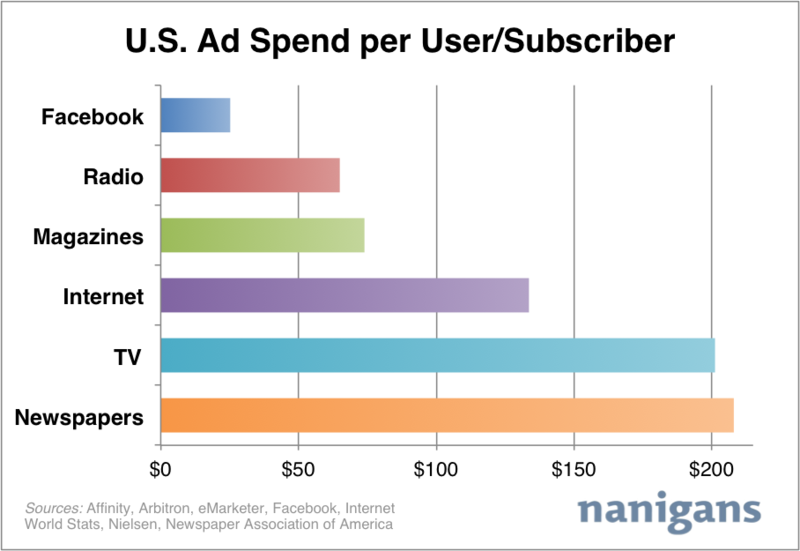 Currently ad spend per person on Facebook is just over $25 on an annual basis in the United States. This compares starkly to television and newspaper, which each garner over $200 per person in ad spend in a given year, as well as the Internet as a whole, which garners $133 in ad spend per subscriber. 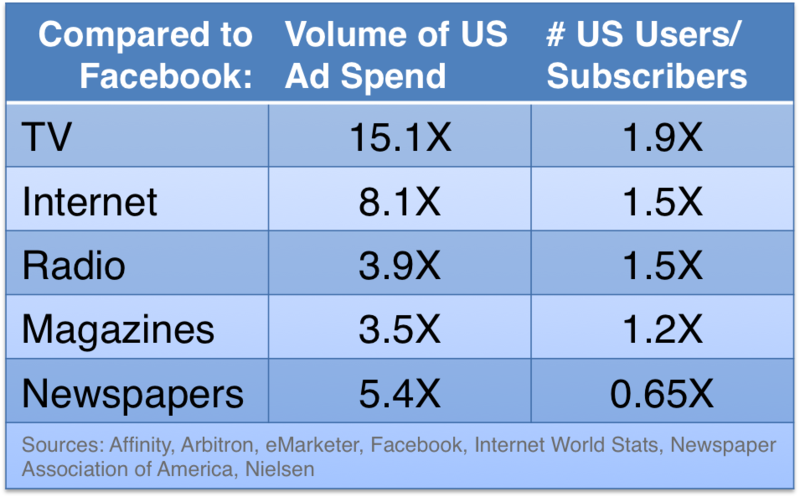 The below table displays the same data as above, broken down into the volume of ad spend and number of users/subscribers each media attracts, and compares it to Facebook as the baseline. Here you note that television attracts 15 times the ad dollars as Facebook, albeit it reaches nearly twice the number of Americans. Perhaps most interesting in this analysis is ad spend on newspapers compared to Facebook, a media type that attracts over 5 times the ad spend in the US and yet has only a fraction of the subscribers that Facebook has. Overall the analysis shows that while Facebook continues to grow its user base to the 1 billion mark and eats up more and more of our time, advertisers aren’t spending an equally proportional amount of their budgets on the social network. Given our rapid growth over the course of 2011 (not to mention eMarketer’s 2012 projections for Facebook ad revenue), we expect these per user ad spend numbers to adjust in 2012 as more advertisers flock to the platform. Of note is that the above analysis focuses only on the United States (as opposed to worldwide), where less than 25 percent of Facebook’s 800 million active users reside. The analysis also focuses on each media’s overall reach, and does not take into account the average time spent on each media. Does anything surprise you about the analysis? Does your company plan to run large-scale ad campaigns on the social network? Let us know in the comments!